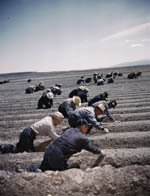 Japanese American laborers at Tule Lake War Relocation Center, Tule Lake, California. Library of Congress. Asian Pacific Americans have a rich, deep-rooted history in the United States, spanning from the first immigrants in the 1800s to the multi-ethnic communities found today. Through a Smithsonian traveling display of 30 banners of poignant text, photographs, and art, I Want the Wide American Earth: An Asian Pacific American Story takes a sweeping look at how Asian Pacific Americans have shaped and been shaped by the course of our nation’s history. For decades, “Asian in America” was not the same as “Asian American.” While the earliest immigrants struggled to be legally recognized as citizens, their descendants fought to be seen as “true” Americans. Additionally, Asian Pacific Americans have played key roles in some of the nation’s most important moments—from the long stretches of the Transcontinental Railroad to the toughest battles of World War II to the streets of Oakland to Washington D.C. Alongside some of history’s greatest names, they campaigned for civil rights and social justice—both for themselves and others. Since the 1960s, and subsequent new waves of immigration, the demographic makeup of America and its cultural landscape has dramatically changed. I Want the Wide American Earth extends beyond the often tumultuous past and marks the unique challenges that exist in a multi-cultural, multi-ethnic society. As one of the fastest growing groups in the nation, Asian Pacific Americans continue to lead the way to the future, serving as pioneers in numerous fields as diverse as fashion design, sports, and science. To complement this banner exhibition, the Japanese American National Museum will display key artifacts from its permanent collection that will give additional perspective to the Asian Pacific American experience. Other exhibition features include Our American Voice—a two-person show exploring the diverse stories of Asian Pacific Americans held every Saturday in the gallery; a free 14-page graphic narrative of the Asian Pacific American story; and a mobile tour app featuring interviews with prominent Asian Pacific Americans. I Want the Wide American Earth: An Asian Pacific American Story was created by the Smithsonian Asian Pacific American Center and curated by Smithsonian Asian Pacific American Center Initiative Coordinator Lawrence-Minh Bùi Davis. The exhibition is supported by a generous grant from the W. K. Kellogg Foundation, and is a collaborative initiative with Smithsonian Institution Traveling Exhibition Service (SITES). For press inquiries, contact mediarelations@janm.org or 213.625.0414. I Want the Wide American Earth: An Asian Pacific American Story closes. Poet, novelist, essayist, fiction writer, and labor organizer Carlos Bulosan (1913-1956) left the Philippines at age 17 to look for work in the United States. What he found was racism, low-paying jobs, and a brilliant and unexpected literary career. In conjunction with the closing of the banner exhibition I Want the Wide American Earth: An Asian Pacific American Story, whose title is taken from one of Bulosan's poems, five Filipino-American writers–including poet Barbara Jane Reyes (Diwata, For the City That Nearly Broke Me) and playwright and novelist Noёl Alumit (Letters to Montgomery Clift)–will read from Bulosan's diverse body of work and from their own in celebration of the centenary of this seminal writer, worker, and citizen. Also featuring Rachelle Cruz, Giovanni Ortega, and Chris Santiago. A two-person show exploring the diverse stories of Asian Pacific Americans. Presented in partnership with East West Players. I Want the Wide American Earth: An Asian Pacific American Story opens. Join us for the opening party for I Want the Wide American Earth: An Asian Pacific American Story. The night will feature comedy and music from YouTube stars DANakaDAN + CREW LOVE and the Fung Brothers. Also, we will premier our new two-person show, Our American Voice, presented in partnership with East West Players. 10:30 PM -- Museum closes. To RSVP for this event, please email specialevents@janm.org or call 213.625.0414, ext. 2222.